Picking the right rugged device for your work can be a tricky decision. Rugged laptops and tablets are both certified to military grade standards (MIL-STD-810G) and work in the toughest conditions. They can survive drops, shocks, vibrations and liquid spills. When selecting a rugged device you want to think about what you need the device to do. If your job requires you to take lots of photos in the field then you need a rugged tablet. If you need to enter large amounts of data for your work, a rugged laptop is better suited to you. In this post we will help you decide which is best for you - a rugged laptop or a rugged tablet. Rugged laptops are made from tough materials that let them function in environments where a normal laptop would fail. Rugged laptops provide reliability, functionality, protection and high quality performance to a range of professions, including military personnel and other jobs subject to unpredictable conditions. Who are Rugged Laptops Best For? Rugged laptops are ideal for people who work from their vehicle and require all the functionality of a normal laptop - only tougher! They are ideal for vehicle installs because of the vehicle mounting dock options and because they will continue to work in the the hot and bumpy environment of a vehicle. Rugged laptops are more powerful than tablets and make it easier to complete office work (data entry, Excel spreadsheets, Microsoft Word) because of their larger screens and built in keyboards. Professionals such as geologists and surveyors usually prefer a rugged laptop because of the software they need to use and tough outdoor conditions they work in. Rugged tablets are designed to the same military standards and can complete many of the same tasks as a rugged laptop. The primary difference with a rugged tablet is that it’s more lightweight and portable which gives the user greater flexibility in the field. 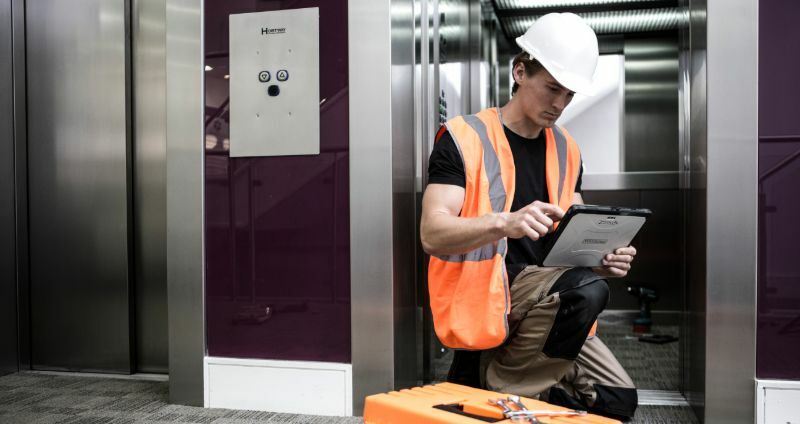 A rugged tablet is ideal for jobs that require lightweight technology on the go. Rugged laptops can weigh between 3 - 4.5kgs while rugged tablets weigh around 1 - 1.5kg. Some rugged tablets have a built-in barcode scanners. This feature is great for warehouse or logistical jobs that require a device that won’t break if it falls from shelves or machinery. You have a wide range of size options with rugged tablets - from 5 inch smartphone sized devices up to 10 inch tablets. There are also a number of rugged tablets that are certified as being Intrinsically Safe. This means they can be used in hazardous areas with Atex zone classification, essential for some workplaces in the oil and gas industry. The line between rugged tablets and rugged tablets is blurred now because of two-in-one devices like the Panasonic FZ G1 which has a detachable keyboard, giving you the best of both worlds. Who Are Rugged Tablets Best For? You now have good options from Panasonic and Getac that give you the best of both worlds - a rugged laptop and a rugged tablet combined into one device such as the Panasonic Toughbook CF-33 MK1. 2-in-1 rugged devices are made for jobs that require normal laptop capabilities but also the freedom and portability of a tablet. You can turn this rugged device from a desktop computer to a vehicle-mounted tablet in just a few seconds! Two-in-one rugged devices are made to meet the same MIL STD-810G standards as any other rugged laptop or tablet. Overall, the rugged device you choose will mainly depend on the type of work you do. If you still can’t decide if you are better suited to a rugged laptop or rugged tablet, a two-in-one will give you flexibility and is a good option for most users. If you need any advice on rugged laptops, tablets or two-in-one devices, ask one of the experts at Roaming Tech by calling 1300 131 933 or contact us online.